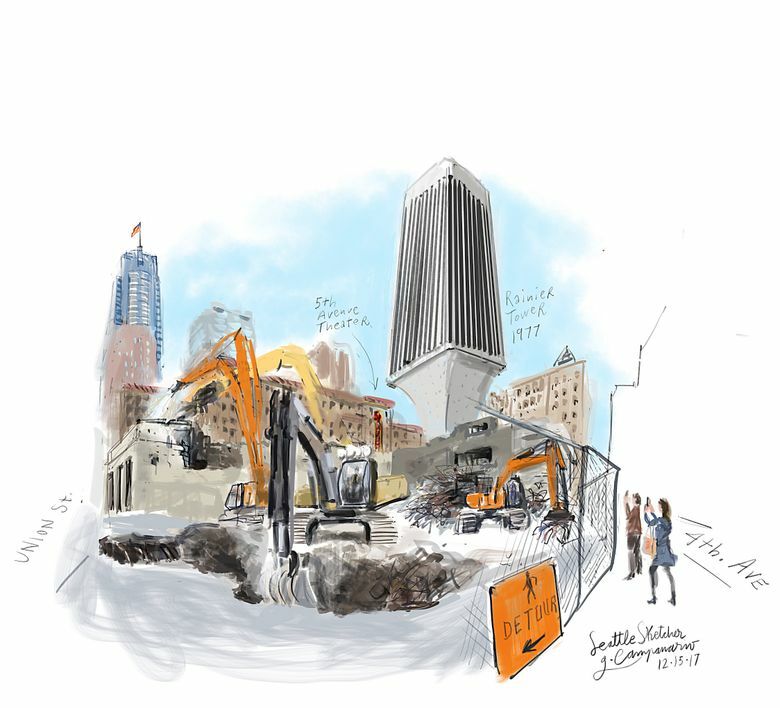 Seattle Times graphic artist Gabriel Campanario was there as the wrecking ball came down on the shopping center adjacent to Rainier Tower this week. The sound of cranes digging in the rubble and pounding on half-demolished walls is louder than the morning traffic going by. I’m standing at the corner of Fourth Avenue and Union Street watching the wrecking ball come down on the shopping center adjacent to Rainier Tower. People around me are taking photos and recording videos with their smartphones. By the time this prime piece of real estate is developed, the Rainier Tower will have a companion skyscraper next door: a 58-story mixed-used tower that will become the second-tallest building in Seattle. Amazon is reported to have already leased all the office space available. Henry Rose, a passerby who recognized me as the “newspaper guy,” had taken a photo to send to his dad because he liked to come to lunch to Crepe de Paris, one of the restaurants in the now gone Rainier Square shopping center. He said there was nothing architecturally special about the hodgepodge of buildings and he looks forward to seeing the future tower. Seattle needs more office space, he added. That’s the thing about witnessing the transformation of a boom town. Every demolition stirs memories from the past and hopes for the future.